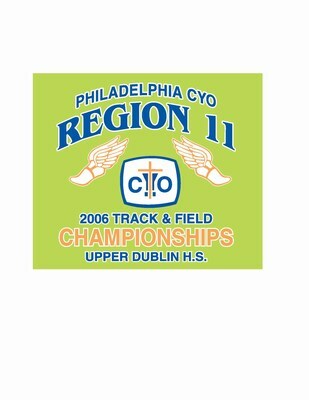 Link to the CYO Night at the Penn Relays PROGRAM (heats and lanes) is at the Philly CYO track blog. Tuesday, April 23, 2019 - Download and Print - copies NOT available Tuesday Night. ALERT: No access to bathrooms in the school, but porta potties are available next to the track. ALERT: Park ONLY in parking spots, NOT along the driveway. DO NOT VIOLATE THIS RULE. Best parking - drive PAST the track to far end parking, which has access to walk-way down the hill. 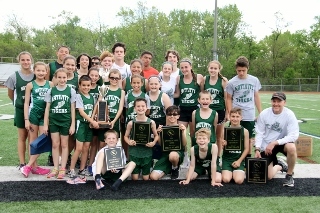 The Philly CYO track blog contains many links to current and historical CYO Track & XC information. PRINT OUT PROGRAM AT HOME. No programs available at Champs. We were shorted Medals and will order additional ones to make sure all top 6 finishers receive their medals. Medalists who picked up their medals for announced results are marked with an "ok" next to their names. Reminder - most races had multiple heats; medals to top 6 finishers are based on "time" by entire division, not by "heat" alone. 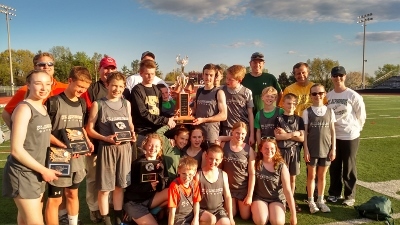 Hy-Tek computer results and updated Parish Bantam records are DELAYED and will be posted by next weekend, June 11-12. ALERT: Instead of one big Varsity-only meet, we will now run two locations on Saturday May 7, 2016 Meet #6. Bantams will therefore be able to run both locations. In addition to Upper Dublin at 9:00 am, we will have an AFTERNOON start at CB South beginning 1:00 pm. Team assignments for these meets TBA. Medals and ribbons for any top 6 finishers who did not pick up their awards at Champs will be delivered to your coach for distribution later this week. TOP MARKS 2015 "Honor Roll"
Top Marks lists for other events to be posted as each list is finished! Links to hard-copy results from Meet #4 April 25th at Upper Dublin and CB South. 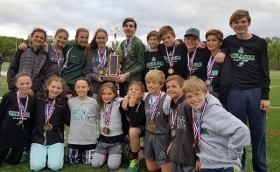 Tue April 21st - Link to CYO Night at the Penn Relays Program with heat and lane info. Good Luck to all our Region 11 athletes. Links to hard-copy results from Meet #3 April 18th at Upper Dublin and Central Buck South. Links to hard-copy results from Meet #2 at Upper Dublin and Central Buck South. Below are hard copy links to results from Meet #1. Top 8 individual finishers and top 6 relays advance to the Archdiocesan Championship Meet. 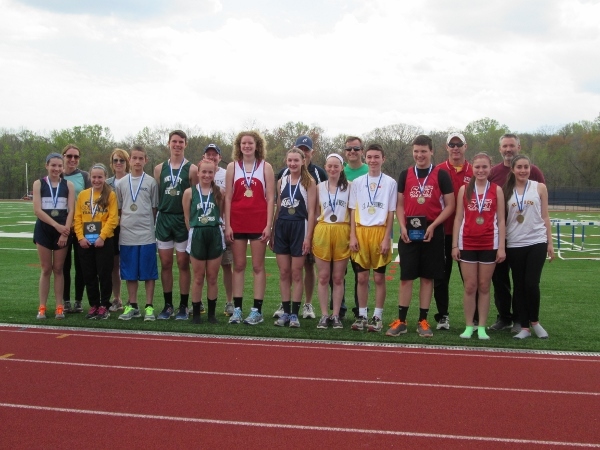 Until results are processed into Hy-Tek, below are hard copy links to results from Meet Five on April 26th at Central Bucks South and Upper Dublin. The Philly CYO track blog also contains a link to LIVE FLASH RESULTS from the Penn Relays. Until results are processed into Hy-Tek, below are hard copy links to results from Meet Four on April 12th at CB South and Upper Dublin. Until results are processed into Hy-Tek, below are hard copy links to results from Meet Three on April 5th at Upper Dublin. (UD's 200m results are posted separately.) Central Bucks South hard-copy results are now also posted. Missing Shot Put hard copy results from Meet Two have now been posted below. Sat June 1, 2013 - Coatesville H.S. 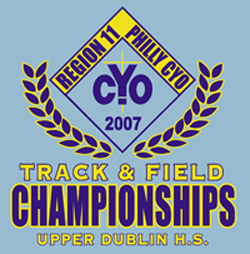 The Philly CYO track blog contains the Archdiocesan Championship Meet Performance List showing all qualifiers, as well as starting heights in High Jump and other valuable information including directions to Coatesville HS. Sun May 19, 2013 - Bensalem H.S. FYI - Area C does not post or release a Meet Program to anyone - you must buy a Program at the track. Full results in htm format. FLASH RESULTS are now for viewing / printing by event. Follow the index on left for each event. Jos/Robt, OLHC, OLGC. Partial results for David, Nativity-Cyril. 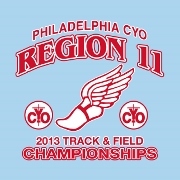 Philly CYO track blog contains all Archdiocesan track updates. Sun May 20, 2012 - Bensalem H.S. This is a Region 11 Fundraiser. Money from each picture sold will be donated to Region 11 CYO. Athletes will use "labels" when signing in for an event - contact your coaches for label info. Sat May 21, 2011 - Central Bucks South H.S. Sun May 22, 2011 - Bensalem H.S. Sun May 15, 2011 - Central Bucks South H.S. 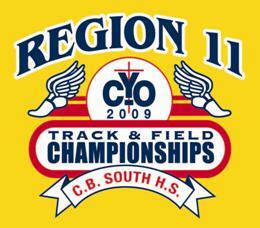 We are re-confirmed that our 2011 Region 11 Championship Meet will be held Sun May 15 at C.B. South HS with our first race (4x800 open) starting at 1:00 pm. Schedule forthcoming. Fri April 8: Note from your "results guy" - all coaches have copies of the results from the 3/26 and 4/2 Meets. I should be up-to-speed with the Hy-Tek software and be able to start posting the results here very soon. Sun May 23, 2010 - Bensalem H.S. Sat May 8, 2010 - Central Bucks South H.S. All Parishes Reported except Hilary. Thank you to everyone who helped make this year's Bantam Championships a wonderful experience for all the little ones. Results will be posted week of May 17-21. Competitors use name "stickies" when signing in for an event - contact your coaches for label info. Our Region had lots of Top 20 teams this year, but only one Top 9 team advancing to the Finals. 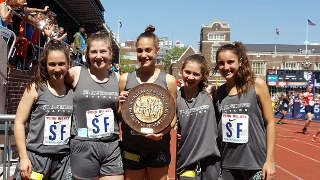 Update: St. Alphonsus Senior Girls finished in 5th place at the Friday Penn Relays Championship in a time of 53.19. Congratulations. Sun May 17, 2009 - Bensalem H.S. Sat May 9, 2009 - Hatboro-Horsham H.S. Sat May 2, 2009 - Hatboro-Horsham H.S. 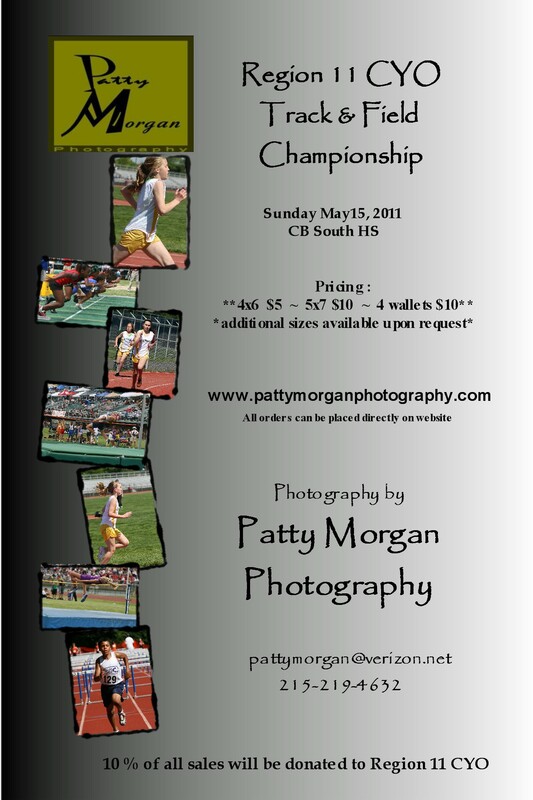 Souvenir 2009 Championships T-shirts will be sold at the Meet for $10 each. Sizes Youth Large to Adult XL. 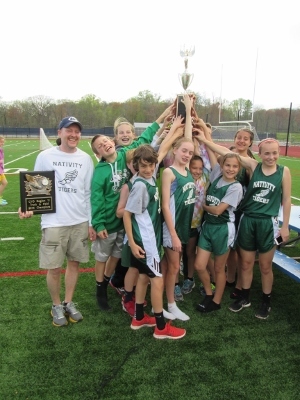 You can find Archdiocesan Championship results from prior years at Philly CYO's track blog site under the Kennett-Timing link. Sun May 18, 2008 - Bensalem H.S. Sat May 17, 2008 - Hatboro-Horsham H.S. Sat May 3, 2008 - Central Bucks South H.S. Archdiocesan Championships on Saturday, June 2, 2007 at Franklin Field (U of Penn). Note: Fri 6/1 at 10:00 am. The Bantam results via Hy-Tek will not be ready until Sunday June 3rd. Check back Sunday night. Sorry for the delay. Area C Championships on Sunday, May 20, 2007 at Bensalem High School. All competitors must use name/division/parish "labels" when signing in for an event - contact your coaches for label info. Please have your labels ready when you arrive at the meet. Update Wed Apr 18, 2007 at 11:00 am: Philly CYO has a new blog site where they post important on-going info. Penn Relays heat and lane assigments are now posted there. Update Wed Apr 18, 2007 at 9:30 am: Full results from Sat 4/14 meets are now posted. Some results have been corrected since their original posting. Please report errors, omissions and spelling or other questionable errors to Brokans@aol.com. All results from the 3/31 meets are now posted. All meets were postponed for rain. Limited make-up meets were held on Sunday April 23, 2006. All meets were postponed for rain. The entire Region ran together in a make-up meet at Hatboro-Horsham on Sunday April 9, 2006. April 9, 16, 23 & 30 Meets BOYS "Honor Roll"
Note: Links to St. Alphonsus and Nativity Track Sites now included.